To date I have had no battery issues spending one night away from the dock, but I would like to start taking longer such trips. After reading many of the related postings here and from Jon Vez on the 355 forum I plan to wire my two stock batteries into a single bank. When they die I'll likely replace them with 6volt batteries. Rather than install a new battery as a reserve/emergency I'm considering a small litthium battery charger such as the Weego 44. I would just have to remember to recharge the Wedge once a month. Does anyone have experience with this type charger? I have used something like that to start my engine when the old batteries were dead. Seemed to work fine, although I don't need to use the glow plugs, which would be a significant draw on the Weego. Would you leave the Weego connected permanently? If so, have you got a battery combiner; maybe that would charge it for you? You could spend the equivalent money to buy another battery reserved only for engine starting which seems a better and more permanent solution typical of what most people choose. An emergency reserve / start battery is just that reserve house power & emergency starting. It is not just for emergency starting. Until an owner has a failure of a bank the reserve part is not always obvious. A Li-Ion jump pack does not achieve the reserve aspect of the banks purpose for redundancy. Also, I have been greatly unimpressed with Li-Ion jump packs and have gone back to larger Ah capacity AGM jump packs for professional use. If something goes awry with the house bank, and it can..
Only 2 batteries on a 30'+ size boat seems insufficient anyway. As a "one-night-out-at-a-time" skipper, that would be sufficient. His point is that he wants to extend his "away time." I upped my OEM batteries and added a third 31battery to my B32-3. I do alot of one/two/three nighters on the hook. I always shut off one so it is up for starting in the morning if needed. With just 2 batts on line, I have set the Victron 600 for the AH of the 2, not three. Even on hot nights with maybe all 6 fans going and newbies leaving lights on plus the fridge, I have never used more then 49 AH, 40-ish without fans. Even at the home slip I have one batt shut offline, so have two for the fridge. Thanks for the helpful comments. I was trying to keep changes to a simple minimum but see the merit in Maine Sail's approach. So, I will add whatever solar I can to the bimini with flexible panels (this has been on the list for a while) and wire all charging sources - shore, alternator, solar - directly to the new house bank (the current batteries wired in parallel); then add a new reserve battery (somewhere). The house bank will be battery switch #1, the reserve battery switch #2. Something must go between the house bank and the reserve battery to charge the latter when a source is present and isolate it when that charging source goes away. Considering I'm after simple are there tried-and-true suggestions for this component? I'd also like to monitor the state of charge of both banks, could this be the same device? Finally - suggestions for the reserve battery? Something must go between the house bank and the reserve battery to charge the latter when a source is present and isolate it when that charging source goes away. Considering I'm after simple are there tried-and-true suggestions for this component? Yep, Blue Sea ARC #7610SI. Does just that. I'd also like to monitor the state of charge of both banks, could this be the same device? start battery charged like that for years now and works great. Lots of reading behind me. I still plan to wire the two existing 4D batteries (I know they are inexpensive, not deep cycle batteries but they are there and have been well cared for so should be good for several years) in parallel to make one bank to be used for house and starting loads. When the 4Ds die they will be replaced with 4GC2s. I'll add a reserve battery and charge it with a Blue Seas ACR off the house/start bank. I'll also add a small flexible solar panel to the bimini. Despite all the reading a few questions remain for which I'd appreciate some insight. 1. Since the reserve battery will rarely be used what prevents it from being over charged? I do not see anything in the Blue Seas ACR literature indicating the unit has this capability. 2. When the 4Ds die and the GC2s are installed the current charger will likely be below the recommended 10%-of-house bank capacity. With the solar panel in place is this such a big deal in every-day practice? 3. Again from an every-day practice perspective do I really sacrifice all that much if I leave the alternator wiring as-is vs. wiring it's output directly to the house bank? 4. The Cat315 bimini appears to have a bit less non-shaded area for a solar panel than the 310 so I suspect my install will be fairly small. 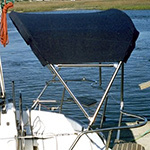 With the new light weight flexible panels will reenforcing the bimini still be necessary? 5. Last one. I had planned to add a Balmar Smartguage battery monitor (easy to install, no shunt needed, no regular calibration required) but with the solar panel it will only provide meaningful information between sundown and sunup. That might be OK, has anyone installed a Smartguage in this situation? The Balmar people recommended instead a new product, the SG200 battery charger. It requires a shunt but does not need regular calibration - does anyone have experience with, or deeper knowledge of, this product? No one mentioned charging. Adding a cheap solar panel, perhaps about 100 W, and charger will cost about the same as adding a battery and has additional advantages. The relative benefit of more batteries vs. charging capacity varies with the use of the boat, but I've always thought solar wattage ~ 70% of battery AH capacity seems a reasonable compromise. Also, if the OP is running his state of charge below ~ 40% the batteries really are not going to last very long. This relates to Mainesail's preference for more lead batteries and reserve power. Has he converted to LED lighting? That's a big one. 6V batteries are very good, but they won't solve problems with usage, deep discharge, and lack of charging. I'd install the charging and LEDs first, so I don't ruin my new batteries. Just found the answer to #1) about the ACR on one of the Forums, and for #5) found info on the new Balmar SG200. Thin - the boat already has all LEDs.